The aviation sector will receive nearly 213 million permits to emit carbon dioxide when it joins the European Union’s Emissions Trading Scheme (EU ETS) next year, the EU’s Executive Commission said. From 2013 onwards the Commission will reduce the annual allocation to 208.5 million permits for the sector, based on a baseline of historic average annual emissions of 219.5 million tonnes from 2004 to 2006, it said. “Emissions from aviation are growing faster than from any other sector, and all forecasts indicate they will continue to do so under business as usual conditions. Firm action is needed,” said Connie Hedegaard, EU commissioner for the climate action unit, in a statement, reuters reports. The EU ETS forces the 27-nation bloc’s heavy industries to pay for permits, called EU Allowances (EUAs), for each tonne of carbon dioxide they emit into the atmosphere. The aviation sector is responsible for around 2 percent of the world’s carbon emissions. From January 1, 2012, all flights arriving or departing from EU airports regardless of nationality or operator will be included in the scheme. The sector’s average annual historic emissions from 2004 to 2006 of 219.5 million tonnes was just over analyst estimates of 216-218 million. Deutsche Bank analyst Isabelle Curien said the sector’s inclusion in 2012 should not have a big impact on carbon prices. Aviation will face an emissions gap of 19 million tonnes in 2012, but airlines are allowed to use U.N. or sovereign carbon credits for up to 15 percent of their overall emissions, Curien said. “They will face a gap but it can be covered,” she added. Other players in the EU ETS such as utilities will not be able to buy carbon permits from airlines in the EU ETS, but airlines can buy from them. 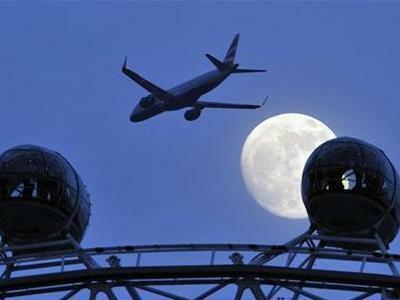 The aviation sector’s 2012 cap is set at 97 percent of the total cap, falling to 95 percent from 2013 to 2020. Airlines will be given around 82 percent of the total cap of permits for free. Around 15 percent will be auctioned and 3 percent reserved for new entrants. The Commission said the inclusion of aviation should have only a minor impact on ticket prices. “If an airline would charge customers for the full CO2 price, with the current carbon prices, the price of an economy class return ticket from Brussels to New York would rise by some 12 euro,” it added. Airlines face a March 31 deadline to report their 2010 emissions to the Commission. The EU executive will then calculate a cap for each individual airline.